No matter your experience, knowledge of the industry, or reasons for visiting, each winery will provide fantastic service and education based on your wants and needs. With over 15 tasting rooms in Edna Valley and hundreds more in Paso Robles, there is great diversity in the hosting environments. This also means that you’re going to encounter a wide range of guests at each winery, and it is important to respect their tasting dynamic. Make friends when appropriate, be conscious of your noise level, and remember that everyone is trying to enjoy their day! 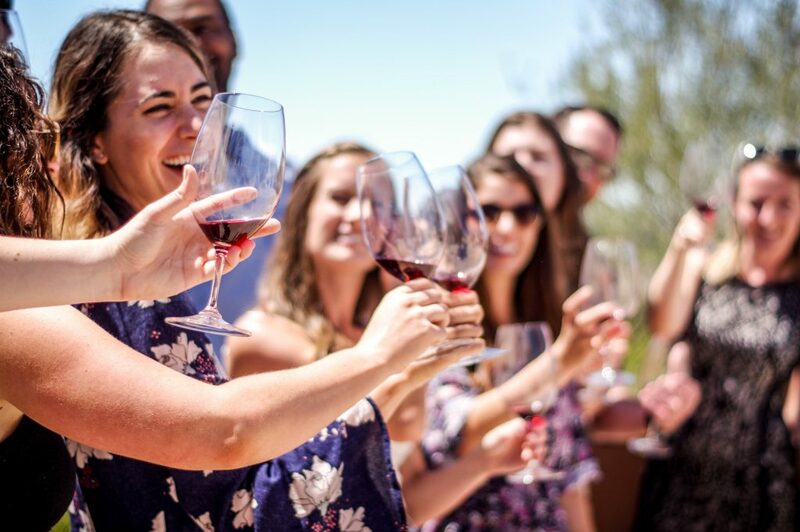 Wineries are staffed according to how many guests they are expecting, so if you show up unannounced with six or more people, it might create a conundrum for the tasting room. Some wineries will begrudgingly serve you, others will turn you down, but the moral of the story is that if you reserve a spot, you know you’ll be welcome! We recommend hiring a chauffeur for any group size, because part of the enjoyment of wine is actually drinking it! Depending on the type of group you have, you can go elegant with a sedan or sprinter, or for larger groups, booking a limousine or bus may be your best route. Regardless of your mode of transportation, it is important that everyone stays safe while traveling throughout the vineyards. The production and enjoyment of wine is a fun and beautiful process. You may learn things about your taste buds, find a new appreciation for Central Coast nature, or make some new friends along the way. There is room for learning and building from every experience, and that includes soaking up some rays while sipping some vino. Additionally, tasting rooms are great places for those who value education. Karen Motto, Director of Key Relationships at Tolosa Winery offers, “Every industry has its own language. If your wine educator says something you don’t understand, ask for clarification. Wine educators are excited at the opportunity to go into more detail when desired.” We agree wholeheartedly—ask away! “Wine tasting is about seeing, sniffing and sipping… not chugging. Each one-ounce pour should last 4 sips, and tasters should take at least 1 min to savor each one,” says Karl Boone, the Direct to Consumer Manager for Niven Family Wine Estates (Baileyana, Tangent, True Myth, Zocker). We agree with Karl—you should be looking to catalogue the flavor range of each wine sip-by-sip! 5. RESPECT THE TASTING ROOM! This point sometimes gets overlooked among tasters: wineries are not bars, and certain behaviors are particularly irksome to the staff and other guests. These include being over intoxicated, loud, or demanding service before you have been attended to in turn. One extremely important rule is that you cannot bring outside alcohol into a winery, even if it’s wine you purchased from a different location that day, or a beverage you were enjoying on a tour bus. Wineries have very specific licensing laws, and it is important to maintain the integrity of these rules. Wineries on the Central Coast typically have a $10-15 tasting fee per person, and buying bottles is a great way to get that fee waved. More importantly, buying bottles supports the wineries and gives you an opportunity to share your newfound tastes with other people who weren’t along for the experience that day. Finally, you can never have enough wine, right? Thinking about a wine tour in Paso Robles or San Luis Obispo? Aside from our weekday discount, here are 5 Reasons Wine Wednesday is Important!